This snack is great on pumpernickel bread, but you may also want to try it on sprouted bread if you avoid wheat. Sardines are a good source of calcium and vitamin D, as well as omega-3 fatty acids, which are known to help reduce levels of inflammation. Caroline Nation developed this recipe for IBS sufferers. 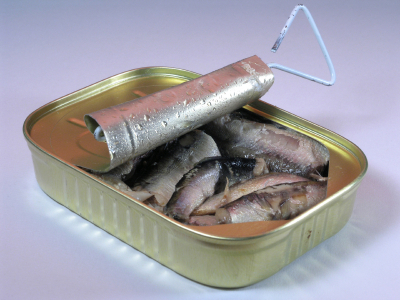 Drain the sardines. In a bowl, mash the sardines and the mustard with a fork. Add the onion and lemon juice and stir to combine. Spread generously on the bread to make two open-faced sandwiches. Per serving: Calories 102; Fat 5.4 g (Saturated 0.7 g); Cholesterol 66mg; Sodium 262 mg; Carbohydrate 1.2 g (Fiber 0.3 g); Protein 11.6 g; Sugar 0.5 g.